The first Galaxy M benchmark has surfaced today, giving us an idea of what to expect from this new series. It was first reported earlier this year that Samsung is going to kill off its Galaxy J, On and C series in favor of a single new series called the Galaxy M.
We exclusively reported a couple of weeks ago that Samsung has two Galaxy M phones in development – SM-M205F and SM-M305F. They may be offered as the Galaxy M20 and Galaxy M30 with 32/6G4GB and 64/128GB storage variants, respectively. 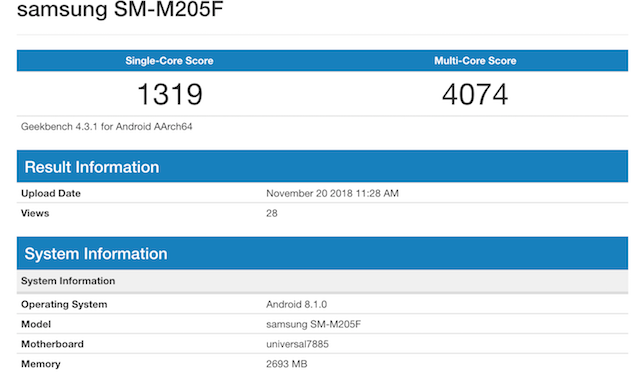 The first Galaxy M benchmark has now surfaced on Geekbench. It’s for the Galaxy M20 or SM-M205F. The listing mentions an Exynos 7885 processor with 3GB of RAM. The device runs Android 8.1 Oreo. There’s not much else that the listing reveals about this handset’s specs. Samsung hasn’t said anything about a new series of Galaxy smartphones. Reports suggest that they might be out early next year. That would explain why they would come with Android 8.1 Oreo and not Android 9 Pie out of the box. If history is any indication, the Galaxy S10 will be Samsung’s first device with the latest iteration of Android out of the box. We’ve previously told you that both Galaxy M series phones will be available with dual-SIM variants but single-SIM variants could be offered in some markets. Since they’re meant to be budget devices, they may opt for LCD displays, but there’s not enough clarity on that front just yet. What impact this reorganization of Samsung’s entry-level and mid-range offerings will have on the company’s bottom line remains to be seen. Its smartphone business is under intense competition in all segments of the market. Samsung is finding it difficult to win customers looking for an affordable smartphone as the Chinese offer more bang for their buck. The Galaxy M might be its first strategic shift to counter the Chinese onslaught.